A small-ish range, I know absolutely nothing about Irregular's orcs. 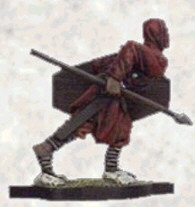 Excelsior carry a fairly small, and extremely expensive, orc range. As such, the figures, while adequate (although no more than that), don't really seem to be worth the money. 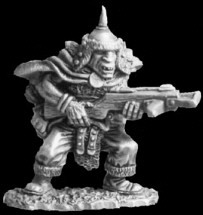 The style is an unusual one, in that these orcs are somewhat more civilised than most, wearing full, and fairly good, clothing! 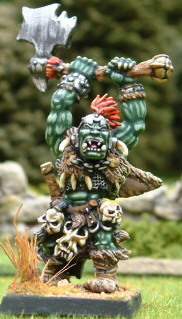 Bob Olley has 10 big Titan Orcs, which are a crossbreed between Orcs and Ogres. They look extremely promising! 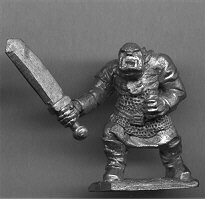 Warrior's orc range is small at only six variants, and is also rather elderly, but they are nice enough figures, and cheap as dirt at 70p apiece. EM-4 sell three rather poorly sculpted plastic orcs. They are however fairly cheap at just 20p each. To be honest though, I'm not sure if they're even worth that. 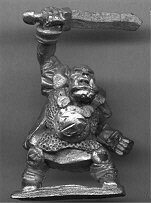 They also produce a range of pre-painted pewter orcs, which, while better than the plastics, are still pretty average, and who wants pre-painted figures anyway? 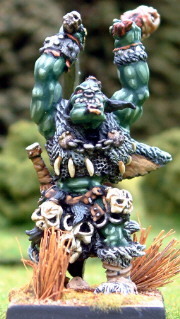 Warcrow have only created one orc so far, but he is a beauty, though a tad on the expensive side. 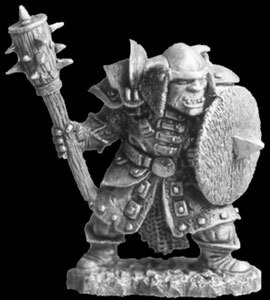 Maybe his kit is a bit more elaborate than one would expect on an orc, but it's always nice to see good old-fashioned chainmail and leather, rather than horrid inch-thick shoulder-plates. 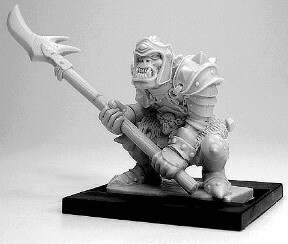 Ilyad's Orc range hasn't been released yet, and only a few variants have been sculpted so far. 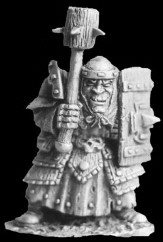 They are beautifully sculpted, with tons of intricate detail, and wonderful orcy faces. 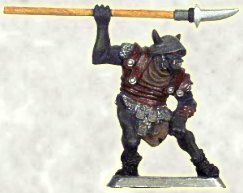 In style, they appear to be 'Rackham but better', with their main weakness being the oversized weapons (as with both I-Kore and Rackham). The armour is a little bit too chunky and thick for my taste, but their's plenty of chainmail in there (which is always a big plus in my mind! ), but they're still fantastic figures! 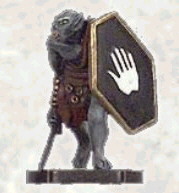 Mithril has an extensive range of Lord of the Rings figures, which, naturally, includes some orcs. These are all designed for the collectors market, and are scattered through several ranges. Most of their figures are a little dated, or just not particularly good, especially given the price, as well as arguably not being as true to the books at Black Tree's line. 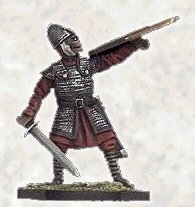 Russian manufacturer of multi-part plastic fantasy miniatures. 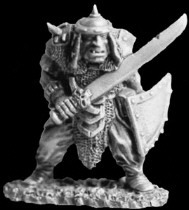 They have a boxed set of plastic orc figures, with full command and an Orc maiden, but there are no pictures available at the moment. 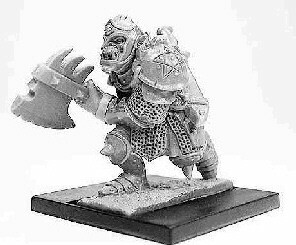 Renegade's orcish pair are nice enough figures, very much in the same style as Dragonrune and the more recent EE stuff (e.g. 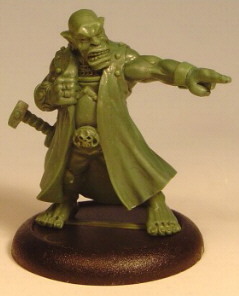 "Grimgor" et al), with good detail and plenty of character. They are however ridiculously expensive, and I would suggest that there might be a little too much unnecessary clutter on both models. 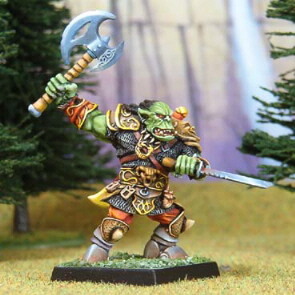 Renegade have stated an intention to make a few more orcish characters, but no rank-and-file will be forthcoming. 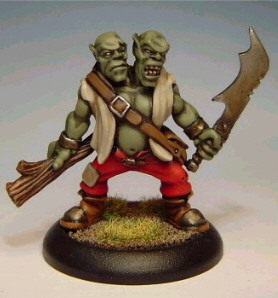 I'm grouping these two together because they're both by Steve Buddle, and both are sculpted in pretty much the same style. 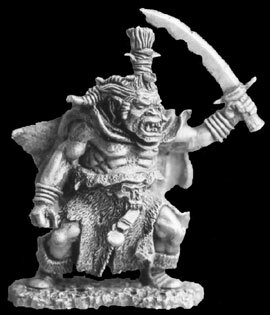 They're both nice, clean sculpts, but the mercenary has a vastly superior pose, since the arm-position of the two-headed orc does make him look a bit flat. They should fit in well with the Foundry and Crusader orcs. Click here to continue this Showcase: previous page - page 1 - page 2 - page 3 - page 4.